Gerry Gold reviews Local Food, which was inspired by the Transition Town movement. In just four years, the Transition movement has sprouted from its roots in the fertile soil of Kinsale in Ireland to a world-spanning branching network of activists whose influence is resonating far beyond their own localities. Echoes have reached local government; BBC Radio has converted the long-running Archers and Prince Charles has even visited Llandeilo, the first Transition town in Wales. Its mushrooming rate of growth is living proof of the activity of millions of people who’ve become disenchanted with the state of the world, fearful for the future and determined to make a change. Local Food inspires people to build a community response to the commercialised, commoditised exploitation of the environment. It shows how the power of creative people working collectively can begin to oppose the dependence on a food chain controlled by global corporations. It draws on the experience of a wide range of community projects, bringing together the lessons they’ve learned from allotments, sharing gardens and community support for agriculture, through to farmers’ markets and food co-operatives. The span of activities covers a wide range of what’s needed to minimise energy use, including the elimination of chemical fertilisers. Pam Warhurst and grandmother-of-nine Mary Clear who launched the Todmorden Incredible Edibles are two among the unlikely radicals whose practical activity populates the book. Local Food traces the history of their guerrilla gardening back 350 years to the Diggers, the “True Levellers” who began growing vegetables together on privatised, previously common land when prices rose as a result of the enclosures. As it matures, the Transition movement absorbs more aspects of the rapidly-developing social, economic, ecological and political crisis that has brought humanity to the brink of a new era. Its founder Rob Hopkins, co-author of the book with Tamzin Pinkerton, tells of his moment of epiphany when he discovered that the production of oil which we’ve come to rely on to power our way of life is nearing its peak. Peak oil was soon joined by climate change as the twin drivers motivating the movement. In the latest book the global financial and economic crisis makes its impact felt. Hopkins and the other founders of the movement are aware of the limitations of their approach. They say: “Any successful navigation of the next twenty years will require action at international, national, regional and local levels, and at that local level will require a huge range of diverse organisations.” And they’re right! As frustration and popular anger grows against governments blinded by the imperative of capitalist economic growth and its logic of destruction, many within the Transition movement are taking up the challenge. a zero-carbon Britain report from the Centre for Alternative Technology. It suggests a very different pattern of land use if we are to be considering energy production from biomass as well as supporting a “diet for a small planet”. the work of Simon Fairlie, editor of The Land magazine and author of Can Britain Feed Itself'? and the recent follow up on Can Totnes Feed Itself?. Both have a vision of hugely increased national and local food security in a lower carbon world. Friends of the Earth’s campaign on 'Fixing the food chain' which suggests an expansion of what Transition food groups could be considering. 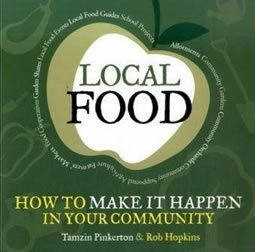 Local Food does what it says on the cover, but the challenges are greater than the scope of the book would admit. The depletion of natural resources and climate change lead directly to the centuries-old problems of land tenure and private property (which the Levellers challenged). Composting capitalism is the number one priority – and with it the exploitation of labour – and the urgent priority.